Slotted bits: 4 - 4.5 - 5.5 mm. Phillips® bits: PH1 - PH2. Pozidriv® bits: PZ1 - PZ2 - PZ3. 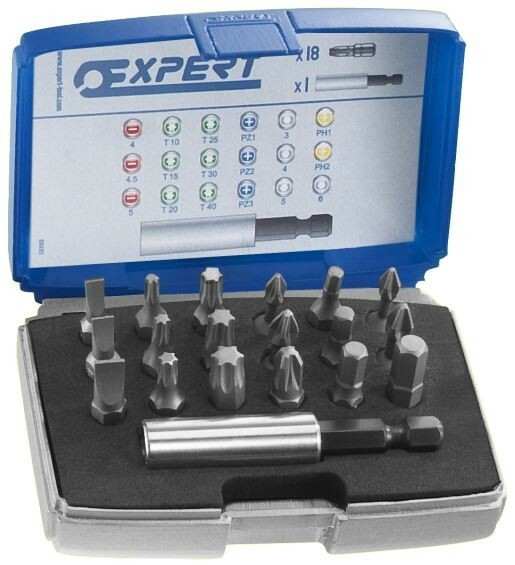 Torx® bits: T10 - T15 - T20 - T25 - T30 - T40. Hex bits: 3 - 4 - 5 - 6 mm. Magnetic bit holders.Supplied in compact high strength plastic storage case.